The National Academy of Fine Arts (NAFA) has three galleries located within its Campus 1 along Bencoolen Street. By nature of its connection to NAFA, the three galleries offer an unrivalled insight into the future of the arts in Singapore. The composition of artwork within Galleries 1 and 2 is highly diverse, including work from NAFA’s School of Visual Arts as well as from local and international artists. Gallery 3, also known as the Lim Hak Tai Gallery after the founding principal of NAFA, features thematic exhibitions containing artwork from NAFA’s permanent art collection and other international contributions to the school. The NAFA Art Galleries are located along Bencoolen Street, facing the pedestrian pavement. The quickest way to get there is by MRT to Bugis station, followed by a short 10 minute walk towards NAFA. Admission to the galleries is free. 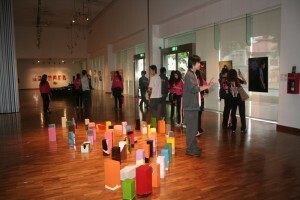 More information is available at the NAFA website here: http://www.nafa.edu.sg/Facilities/ArtGalleries/Profile.html.